Cardinal Tagle has stressed that charity is to be done from the heart, never out of obligation nor with a superior attitude. Speaking at an international congress recalling Pope Benedict XVI’s Deus Caritas Est in the New Synod Hall of the Vatican’s Paul VI Hall this morning, the Filippino cardinal, who is leader of Caritas Internationalis, emphasized how the encyclical taught this. The encyclical, the cardinal highlighted, can definitely shed much light on our contemporary situation. But at same time, the world and its events, can affirm, challenge, can expand the encyclical’s legacy, he noted, adding that the Jubilee Year of Mercy will also provide ample opportunity to reflect upon it. These five orientations, and the way they were created, he observed, carry the mark of Deus Caritas Est, and he noted that at the same time these orientations open paths not explicitly contained in the encyclical. 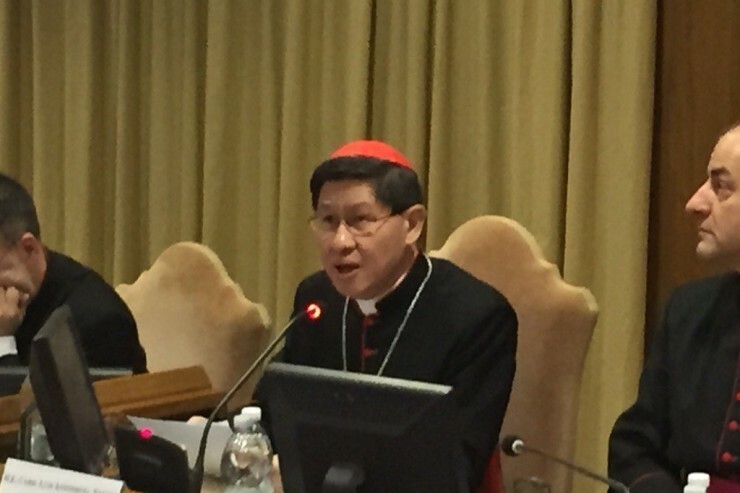 Some of the other points Cardinal Tagle made were that those who work in this realm need both professional competence, but also “training of heart,” and noted how these qualities are complements, and not to be pitted one against the other. He also lamented when a Church has a separate office of charities, because he stressed this is part of its mission and is to be part of its identity just as liturgy and the sacraments are. In addition, he criticized those who do charitable works, but with an attitude of superiority and self righteousness, looking down at those they are serving. Instead, those serving, Cardinal Tagle declared, are never to hold their noses up in the air, but rather to serve as one who understands poverty and seeks to share in the suffering’s joys and sorrows, like a brother or sister.